UPDATED: Stock in Oslo-based Norwegian Air was soaring on Thursday after news bureau Bloomberg reported on a possible purchase offer from the owner of British Airways, IAG. Shares in Norwegian Air Shuttle were up more than 22 percent by midday and flew even higher just an hour later. 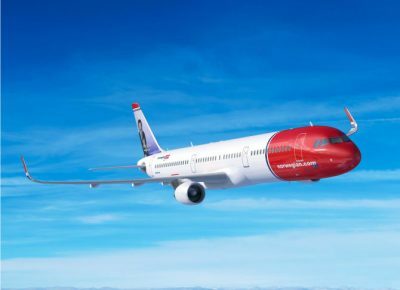 Bloomberg reported that IAG was evaluating an offer that would value Norwegian at USD 3 billion, or around NOK 23 billion. The airline’s shares quickly became the next-most actively traded on the Oslo Stock Exchange, second only to Statoil. IAG confirmed by noon Oslo time that it was considering an offer. It issued a press release in which it described Norwegian as “an attractive investment” and disclosed that it already owns 4.61 percent of Norwegian’s shares. Trading of Norwegian stock was so heavy that the Oslo Stock Exchange ordered a pause because of the uncertainty flying around a possible purchase offer. When trading resumed in early afternoon, Norwegian’s stock really took off, up 44.6 percent shortly before 1pm to NOK 259 per share. Others dismissed an offer from IAG as unrealistic, especially at Bloomberg’s estimated value of NOK 23.4 billion. That reportedly would need to cover Norwegian’s debt, which stood at NOK 22.3 billion as of late last year, valuing the company itself at just over NOK 1.1 billion. Commentator Thor Christian Jensen at newspaper Dagens Næringsliv (DN) claimed the Norwegian Kjos family that still controls Norwegian would never accept such an offer. IAG wrote in its press release that no decision had been made on whether to actually make an acquisition offer, and there was no certainty that such a decision would be made. The goal, according to IAG, is to “establish a position” for discussions with Norwegian, including the possibility of making a bid for the entire company. It confirmed there haven’t been any discussions between IAG and Norwegian so far. Norwegian Air has become one of Norway’s biggest international business ventures, with the airline still controlled by its affable if tough boss, the former fighter jet pilot Bjørn Kjos, and his family. Kjos developed it from being a shuttle service on Norway’s West Coast into a domestic carrier with lower fares and far fewer passenger amenities than those offered by arch rival Scandinavian Airlines (SAS). Its popularity took off and Norwegian quickly spread its wings around Europe, becoming one of the area’s major cut-rate carriers. Norwegian’s recent and ongoing expansion into the intercontinental market has had mixed reviews, with both packed planes but also a lack of back-up plans when things go wrong, as they often did with the introduction of Norwegian’s new fleet of Boeing 787 Dreamliner aircraft. Various technical and mechanical problems with the aircraft resulted in passengers being stranded, also by ongoing labour conflicts in its European service as well. The report of a possible acquisition comes just days after news that Norwegian has attracted more than four times the number of passenger complaints than SAS, not least after the airline’s failure last year to have enough pilots to fly all the routes it was offering in its summer program. Norwegian is also saddled with heavy debt tied to its massive expansion. A tie-up with another established airline could help solve the problems created when Norwegian’s service is disrupted. Norwegian wrote in its own statement on Thursday, however, that the airline thinks IAG’s interest “confirms the sustainability and potential of our business model and global growth.” Kjos, who has expressed interest in tying up with carriers that could augment expansion in Asia, himself was said to be traveling abroad and unavailable for comment. The Norwegian investment company Ferd, Norwegian investor Egil Stenshagen and share fund DNB Norge also have major stakes in the airline.